I first know of Innisfree is from this Jeju Volcanic Pore Clay Mask. I have enlarged pores problem and many people recommended me this. The mask is made from mineral ingredients from Jeju volcanic clay. It helps brightens the skin and shrinks pores. On top of that, the clay removes sebums and impurities from the pores to thoroughly clean your skin. This product is also one of the best sellers from Innisfree. It has a whole range of products that made from the Jeju volcanic clay including facial wash, moisturizer and many more. Jeju volcanic clay, great for controlling sebum. Clean Jeju volcanic ingredients made by the stiff lava after the volcanic of Jeju exploded clears the deep pores with strong purifying function. · The texture is thick and covers the pores thoroughly. Although it dries up easily, the mask remains soft and damp. · No visible improvement immediately. I do not see any difference after a month of use. I do not see any immediate results in terms of my pores being minimized after using it for 2 months now. However, I do like the texture of the mask. One of the obvious improvement is, it withdraws impurities from the pores effectively. If you do extraction at home, I do recommend you to use this mask prior to extraction. It does lift up some hard to reach black heads and white heads. Have you tried the Jeju Volcanic Pore Clay Mask? If you have, let me know if it shrinks your pores? I really love to know if it's just my skin that don't react to it, or is it the product lack of efficacy. I purchased this from Althea. As usual, I would like to extend my referral link to you. 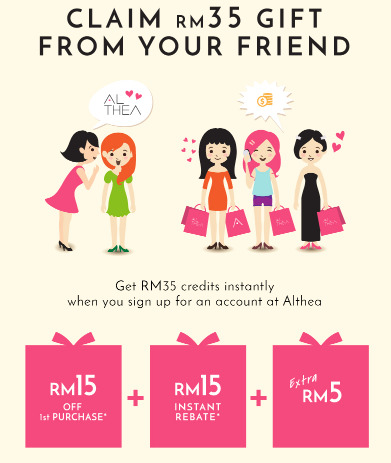 If you are first timer to Althea, sign up using my referral link <<here>> and you will receive a RM35 voucher. I don't earn any commission from your purchase and I won't be able to see your purchase. What I get is just 10 points from the referral I made. This points enable me to trade for beauty products from Althea.